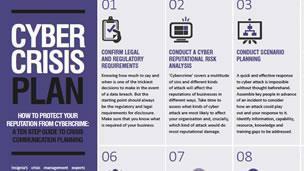 Having a cyber incident response plan is an important part of protecting your reputation in the event of a data breach. Giving your cyber incident response team the crisis management skills and confidence to do and say the right thing is just as critical. Knowing how much to say and when is one of the trickiest decisions to make in the event of a data breach. Insignia provides cyber incident training that removes much of the guesswork and helps your people deliver a pitch perfect crisis response. Cyber simulation exercises are essential to ensure your team would do and say the right thing in response to a cyber attack. Insignia develops realistic cyber crisis exercises that rehearse your team, test your plan and identify where further improvements can be made. As a first step in rehearsing your cyber incident response plan, we recommend a facilitated desktop exercise. In this type of cyber crisis exercise, Insignia’s facilitators will probe and test your cyber incident team’s response to a realistic scenario such as a DDOS or Cryptolocker attack and help you to think the unthinkable. Teams that have already completed an initial exercise should then be challenged with an immersive and highly realistic cyber crisis simulation exercise. Insignia develops a detailed cyber crime scenario which is brought to life through role players, media interviews, social media and broadcast footage. The escalating crisis challenges your cyber incident response team to make decisions and communicate under pressure. Learnings and recommendations for next steps are captured in a detailed feedback report. Running regular cyber exercises mean you won’t have to wait for a real incident to find out whether your cyber incident response plan works, or that your team has the skills to succeed. Communicating about a data breach is challenging and sensitive: admitting that you don’t know exactly what has happened is uncomfortable, but saying nothing can be the most damaging thing of all. Insignia’s crisis media training for cyber spokespeople ensures they are able to communicate clearly and credibly under pressure, and protect your reputation in the event of cyber crime. By developing media handling skills and using case studies from organisations which have grappled with data breaches for real, we coach spokespeople on best practice in cyber crisis communication. With crisis communication theory covered off, we give delegates practical experience of handling the media with role played interviews based on cyber crime scenarios developed specifically for your organisation. This experience of on camera interviews with a working journalist combined with coaching from Insignia’s crisis management experts equips your cyber spokesperson with the skills and confidence to succeed under pressure. How did our clients feel? Ready to start protecting your reputation?